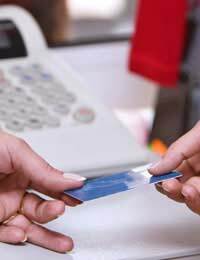 Since 2006 how we pay for goods and services on the high street has changed as a result of Chip and PIN. The purpose of Chip and PIN is to make it harder for fraudsters to steal money from your bank account or to buy goods using your credit or debit card without knowing the four digit PIN (Personal Identification Number) that authorises your card. Chip and PIN is a simplistic idea functioning with some sophisticated technology. You will have doubtlessly over the last couple of years received upgraded credit and debit cards from your bank which contain a small chip on the front and a magnetic strip on the back. The chip on the card stores the information related to your bank account and allows the Chip and PIN system to access details of your bank through the central clearing house. This is how retailers are able to approve your purchases in store. The system is made more secure by the fact that each individual who has a Chip and PIN card has their own unique PIN (Personal Identification Number). This number is unique not only to that individual's card but also to it's corresponding bank or building society account. So if the PIN number that is entered is invalid the purchase or withdrawal of money will be refused. What Precautions should I take using Chip and PIN? When you are using your Chip and PIN card and it is necessary to enter your PIN number you should ensure where possible that there is no one around you to see the number you are entering. If there is you should ask them to take a few steps back so that they cannot see what you are doing. Some criminal gangs operate a system called Shoulder Surfing where they purposely attempt to see over the shoulders of individuals keying in their PIN numbers and then steal their credit or debit cards. Also memorise your card's PIN number if you can. If the number is such that you feel you won't be able to memorise it contact your bank, building society or credit card company and ask them to change it to something more memorable. Don't write your PIN number down or leave it where it can be seen by others. Once you have received confirmation of your PIN number and are sure you have memorised it destroy it. You shouldn't keep details of your card's PIN number in your wallet or purse. If either of these items are stolen containing your credit or debit card then you are giving the thief the opportunity to take money from your account or to buy goods with it before you can have the card stopped. If you follow these simple steps you will find that your Chip and PIN card serves you well and also acts as a means by which to transact business safely. If you require further information on the Chip and PIN system in operation in the United Kingdom you can find it by visiting your bank's website. Additionally the local branch of your bank or building society will be able to provide you helpful advice and the facility to change your PIN number should you need to.